If you don't have the time to play Overwatch, but you don't want your rank to decay, you have come to the right place. We can provide the cheapest Overwatch rank maintenance service to ensure that you do not lose any skill rating while you are away or not available to play. After choosing what kind of Overwatch boost you want you proceed to checkout and payment. We have a system that notifies all of our Overwatch boosters of the new order meaning in most cases it is started very soon after buying. You will be granted access to our Members Area and after that you can also talk to him/her during the process on our direct chat. You can message us via live chat which is located at the bottom right corner of the website, we are live 24/7! No, all our boosts are completed by professionals and no hacks are used. 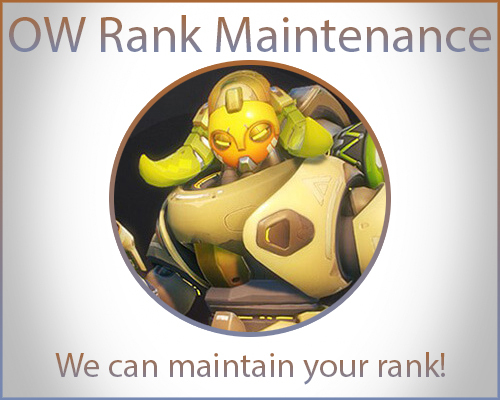 Is your Overwatch Rank Maintenance service available on all servers? Yes, you can select your server during the checking out process. Can I play Overwatch while the booster is offline? Yes, you can play Quick Play but not Competitive Play. Don't worry we also provide Leveling services for Overwatch. We provide fast, cheap and reliable boost with 24/7 support on live chat. We have a database which allows us to start all orders almost instantly after the purchase. You can also talk to your Overwatch booster on direct live chat throughout the process. That makes using our services very simple and satisfying to use like no other site. Every Overwatch boost is very likely to be started almost instantly using our system which informs boosters about new orders straight after the payment. We will play 5 games either in one week or one day, depending on how you want it done to ensure that you keep your rank from decaying. Excellent quality maintenance up almost 200SR from where I started. Almost back up to my season high. Dan was very professional at all times. Highly recommended. cant priase mike enough for good service and helping me maintaining topp500 account . second time he has delivered more than he should!. ended up with more sr to ! great service, needed help when work took all my gametime. Booster even played me 80sr higher in GM account! nice guy to!